...take note of one of the most puzzling, frustrating, impotent offensive attacks in the country: 109th in total offense, 97th in passing, 90th in rushing – despite having the nation’s 23rd-leading rusher – and 109th in scoring. This was an offense that gained more than 400 yards of offense only once, that passed for more than 200 yards only four times, that was skunked by Virginia Tech, that scored 13 points against Notre Dame and managed only 185 yards of offense in a bowl loss to Nevada, a team not known – and this is being kind – for being intimidating defensively. Pre-Snap also thinks Spaz's seat could get hot if we struggle. This preview post looks at our consistency and wonders what will happen to Spaz if we slip this year. Add Donnie Fletcher to the list of players that HD likes. BCI held a Q&A with a UMass blog. Former Eagle Dan Mulrooney is continuing his football career at Stony Brook. BC is not the only private school trying new ideas in an effort to spark lagging ticket sales. Is anyone surprised that BC is included among the schools that Brooks Brothers selected for their special themed line? BC's latest OLine commitment is saying all the right things about BC. I am just glad we are still a factor in New Jersey. Sean Williams is getting a serious look from the Phoenix Suns. At this point I would be shocked if he ever becomes a regular contributor in the NBA. HD thinks we have the best linebackers in the conference. She even takes the time to discuss names other than Kuechly's. Castonzo plans on starting a foundation for cancer research. Here is the latest on Ed O'Bannon's suit against the NCAA. Doug Flutie is sitting on millions if he joins the suit. How big should this recruiting class be? With BC picking up two more recruits, many are wondering how many spots are left. Consensus is this will be a small class. But how small? Will BC only sign 14 or will they push the limit and get to 20 or more? In his second year Jags took a huge class. TOB was much more conservative. Spaz has signed smaller classes so far. I tend to support signing bigger classes. When you push your total signees, you slightly increase the upside of the class. The risk is that you might over sign and force out a deserving 5th year player. But our history of attrition (whether through injury or "fits") is fairly predictable. That is why I doubt we will ever have a class of only 14 guys. Fresh off the "Father's Day Sale" come two more signs that ticket sales are not where they need to be. One is innocent enough. The other is more troubling. The first promotion involves parents who buy tickets for Parent's Weekend. They now have they option to buy Northwestern tickets at a discount. Parent's Weekend has always been a strong seller so it makes sense to build off of that momentum. Plus I am sure BC is figuring that a lot of BC parents will be dropping their kids off around the time of the Northwestern game. What I find troubling though is that Northwestern cannot sell out on its own. If BC cannot sell out a Big Ten game on Labor Day weekend, then they shouldn't be playing Labor Day weekend. The much bigger issue is that some non-DBS ticket holders are getting a chance to buy DBS tickets this season without the requisite donation. This is supposedly only a one time waiver good for this season, but like all other discounting, what sort of behavior are you creating in the marketplace. And how will your usual DBS donors react? As I have said before, this season may be a wake up call with how BC manages its relationships with its most important customers. It also may be time for Gene and Spaz to raise expectations, not lower them. When the BU job opened, I said they should hire someone with BC ties. My hope was that they would give an opportunity to someone like Pat Duquette or give a second chance to someone like Al Skinner. Instead they hired Donahue's top assistant Joe Jones. While I am happy for Jores, this is a setback for BC. Jones has been our lead recruiter and was critical for us landing much of our 2011 talent. He was also experienced at this level and someome Donahue trusted. It will be very hard to find an Ace recruiter who understands Donahue and "gets" what it means to recruit at BC on short notice. As for how Jones will do at BU...I am not sure. His run as Head Coach at Columbia wasn't inspiring, but BU will allow him to cast a wider net on the recruiting trail and he inherits a program on the rise. Good luck to him. Reggie Jackson to Oklahoma City was also a surprise. With all the speculation of preDraft side deals, OKC rarely came up as a landing spot. In retrospect it makes sense. The Thunder are one of those teams that puts a premium on statistical metrics and Reggie was a very efficient coilege player. The selection has some pluses and minuses. The good news is that Reggie was selected and will get a guaranteed contract. This justifies coming out early. It is also good news that he joins one of the rising powers in the NBA and is surrounded with young talent. The downside is OKC already has a lot of minutes and money tied into guards and wing players. Where will Reggie fit in? My guess is they view him as a combo who can give them solid minutes at the 1 or the 2. Can Reggie thrive like that? I don't know. I would have preferred he landed at a veteran team like Boston or Miami that need his fresh legs and instant offense. Now he will have to work hard to prove he can compliment Westbrook and not just be a Westbrook clone. But in the end Reggie made the right call and I wish him nothing but the best. A few weeks ago HD ranked the coaches of the ACC. With Butch Davis's seat getting hotter, I started thinking: would a guy like Davis ever have fit in at BC? So with "fit" and ability as criteria, here is my ranking of ACC coaches as potential head coaches at BC. 1. Al Golden. I was always a bit skeptical of Golden but his time at Temple won me over. BC had chances to hire him and probably should have. 2. Mike London. I don't know if he will ever win big at Virginia, but I think London could have been a breathe of fresh air at BC. 3. Randy Edsall. Another guy who was nearly BC's coach and wanted the job every time it came open. I don't think he has the personality of London or Golden but he would have competent. 4. Spaz. Yes, I rank our actual coach as only the 4th best fit for BC within our own conference. We all know Spaz's issues. By placing him here I am admitting it could be worse. 5. TOB. TOB in 1997 was a very good fit. If he were to come back to BC, I think it would be less fun and less successful than Spaz's regime. 6. Jim Grobe. He would have fit in with the culture at BC but I think his team's inconsistency from year to year is less appealing than Spaz. 7. Frank Beamer. Obviously he's very accomplished. He also flirted with the BC job once upon a time. But I wouldn't want him now given his age. 8. Paul Johnson. I get to observe Johnson up close here in Atlanta. I really like him and enjoy his offense. But he would never fit in at BC. And the whale pants crowd would whine on and on and on about the option. 9. Jimbo Fisher. Another guy who I think is getting better with each season. But he has never coached at a place like BC. I feel like it would be a huge culture shock. 10. David Cutcliffe. He's surprised me in a good way at Duke. He's also a serious Catholic so BC might be a good fit in that sense. My concerns would be his age, his health and his losing seasons. 11. Butch Davis. Even before the scandal I would have questioned his ability to adapt to BC. Now very little is in doubt. He would have been terrible at BC. 12. Dabo Swinney. Does anyone even want to debate this one? I've been a Dabo basher for a few seasons...and that has been while he's been the coach at Clemson. Can you even imagine him on the Heights? The Wall Street Journal noted that BC is one of only four BCS teams that have never been found guilty of any major violation. The other rule followers are Northwestern, Penn State and Stanford. This sort of rehashes my post from earlier this year. It is just not in BC's culture to cheat in sports. Our fans don't care that much. Spencer tries to explain the logic of the ACC divisions. BC lost out on two recruits that seemed like good fits. The first was IL QB Wes Lunt. The bigger surprise though was Jason Sylva's commitment to UConn. We just offered Sylva and he supposedly always loved BC. Something got lost in the sales pitch. We are loaded at LB, but I do have concerns when we lose out to UConn on players that should be ours. Jeff Goodman says Joe Jones and Al Skinner are both in the mix for the BU opening. I would hate to lose Jones at this point. It will be interesting to see how it plays out. I am surprised it has taken this long, but I do think BU is going in the right direction. BC took part in a conference for schools competing for attention in a pro market. I'll have more on this later in the week. The ACC named BC Golfer John Nurczynski to its all academic team. The UFL seems like a perfect fit for someone like Alex Albright. No NFL team was going to draft a injury prone tweaner and making a team as an under the radar free agent is tough any year. Add the lockout and it is nearly impossible. Yet the welcoming arms of the UFL give hima chance to prove himself and earn a spot in the NFL. Good luck to him. Ohio pounded Pennsylvania in the annual Big 33 game. The good news though is future Eagle Dave Bowen stood out for the PA side. Former BC runner Hope Krause is already impressing on the regional 10k circuit. I often feel responsible for some of my dad's agita during football season. Other than the dent in his wallet from tuition, BC should have been out of his mind 12 years ago. But through my fandom and later blogging, he has been fully sucked in. He bleeds maroon and gold like the rest of us. But then again it's all his fault. Like all good role models, he taught me about pain and suffering as a long distance fan years ago. Let me explain. My father was a San Francisco 49ers season ticket holder in the 1970's. As he got married, started a family and watched that family grow, he kept the tickets. His reward was watching the 49ers lose...a lot. Even after suffering through back to back 2-14 seasons, he was still a diehard. Late in the 1980 season, we moved east for his work. He had to give up his seats. In 1981 the 49ers won the Super Bowl and started one of the greatest runs in NFL history. Now a transplanted fan could still watch every game and follow the team with ease on line. In those days, my dad had to savor any Monday Night Football appearence or the occasional late game on CBS. News, analysis and rumors? Forget it. His only source for news was a makeshift clip service my grandmother set up. She would cut out articles from the San Francisco Chronicle and mail them. I can't even imagine. But through it all he still had the passion and still loved his team. I never became a Niners fan, but his passion obviously rubbed off. But I do want to thank him for all he's done, for understanding my love for BC, and for giving me hope. He stuck with the 49ers and it paid off. Maybe one day BC will have their moment in the sun. BC beat writer picked the middle of the summer to rehash and look back on BC's move to the ACC. Blauds has always been a subtle critic of the move and used BC's lack of championships as a jumping off point for the piece. Most of it is worthless regurgitation of old talking points, but there are a few worthwhile pieces of information inside. Spaziani has continued to build, although he sees some choppy waters ahead. This is another example of where I think Spaz needs to change his approach with the media. It comes off as lowering of expectations. That public attitude impacts players and fans. Former Big East commissioner Mike Tranghese, who had an up-close look at BC’s departure six years ago, says that while he didn’t agree with the way BC departed, he understands the reasons. Tranghese's certainly softened his stance. This is as much of an "I was wrong. They were right" admission as you will ever get from him. It probably doesn't hurt that he is no longer employed by the Big East. But I also hope he realizes that his attempts to bully and belittle BC publicly only made the BC community that much more determined to leave. I've been on board with the UMass series, so this confirmation is good news (for me). A two-for-one with the away games at Gillette is a no brainer. Hopefully UMass will take it. They are unlikely to find four road games against a BCS opponent that would be a bus trip. 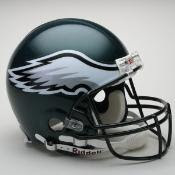 But DeFilippo also helped by not overburdening the Eagles in their nonconference schedule, turning seven-win seasons into nine-win seasons and nine-win seasons into 11-win seasons. BC’s nonconference record since 2000 is 48-9. But in those 57 games, it faced only five ranked opponents. In fact, until the Eagles faced (and lost to) No. 13 Nevada in last season’s Kraft Fight Hunger Bowl, they had not played a ranked nonconference opponent since 2004. So now the narrative as to BC's watered down schedule is that it helped TOB build. I got it. Still that doesn't explain the current philosophy. Who are we helping build now? I clearly understand Gene's point. I was a student when our non-conference schedule was Ohio State, Notre Dame, Michigan, Michigan State and Army. We don't need to do that every year. I also don't think we need to play a schedule more difficult than most. But Gene also needs to realize that a big name opponent will help interest in the program. The only thing about the article that surprised me was the timing. I am not sure why Blauds is writing it now. It will be interesting if some of the talking points established here will get reused if BC struggles this year. Even though many of our top players leave before graduation, the hockey teams have very good academic track records. To reinforce the point: 17 men and womens hockey players made the Hockey East All Academic Team teams. Congrats to both teams and their academic advisors. This is a great article on Northwestern's coach Pat Fitzgerald. I hope BC benefits from some of Fitzgerald's questionable in game tactics. Yet another post on Reggie Jackson's preDraft maneuvering. My only nitpick is the writer's opinion that the Celtics are not a good fit for Reggie. When talking heads discuss Matt Ryan the usual theme is that he's good but not in the elite. Finally someone has crunched the numbers to show just how good Ryan really is. All he needs now a deep playoff run to change the perception about his style of play and his upside. HD's posted a series of rankings articles. I ignored the coach version, but cannot let the QB one slide. I know Rettig still has a lot to prove but do how can he be ranked behind so many guys who have barely played? Jason Sylva is excited about his BC offer. Here is more speculation on Reggie Jackson having a wink-wink deal with an NBA team. I hope Reggie is getting good advice. If he doesn't get drafted, skipping the workouts will look like a huge mistake. Finally, I just found out today that former BC linebacker and backup QB Kevin Kiley is now WWE superstar Alex Riley. BC launched a "Father's Day Kickoff Sale" Wednesday. Like other recent efforts, I applaud the push by the Ticket Department, but worry that BC's aggressive marketing is a sign of a bigger problem. I know that football ticket sales are down again. There is always a decline in years in which BC doesn't play Notre Dame. But the trending is worse than previous non-Irish seasons. Then there are the season ticket renewal anecdotes. Now comes the Father's Day sale. Considering the season is two months away, I think it is too early to start major discounting. What does that signal to your most loyal customer base? Like any situation with slack demand, BC has to be careful how much they devalue their own product. BC put this sale in a limited window, but I have a funny feeling we will see more sales as the season approaches. If you ask Gene why sales are lagging, he will tell you the economy, television and secondary market reselling have contributed to the decline. Those are factors. So is the gameday experience and the product on the field. I wish I had a simple solution but I don't. My fear with the front loaded home slate and the low expectations, we could see our lowest attendance figures since the early days of TOB. Because there is no simple solution, I think BC is stuck dumping tickets at low prices. It may offset things a bit. In the long run, I hope all the factors are recognized and BC does a better job rebuilding the game day experience. Winning is the best sales driver but so are relationships and expectations. BC needs to rebuild relationships with their most loyal fans. And BC needs to coach Spaz into being a better face of the program. If those things don't change, BC will be giving tickets away soon. With the season over and the NBA Draft approaching, things are starting to come into focus for Reggie Jackson. Early speculation about him going undrafted or concern about his injury seem overblown. Here's what others are saying. SI.com restates what we've all heard: the Celtics will take Reggie if he is available. Danny Ainge attended many BC games over the last three years. He probably has a better feel for Reggie than any other NBA GM. I believe the speculation. Plus Reggie could fit in with the C's as a backup for Rondo and Allen. The only question is whether Reggie could fit in defensively with Boston. In Slamonline's Mock Draft, their Rockets GM selected Reggie at 23. That actually maes sense. Houston's big on metrics and versatility and Reggie would be an efficient scorer who can play multiple positions. This roundup of the Heat's needs mentions Jackson as an option. Despite their success, I actually think Miami would be a bad fit for Jackson. He'd battle for minutes and they already are wing heavy and without a clear offensive philosophy. Would you prefer a gold helmet with maroon wings or maroon helmet with gold wings? Michigan and Notre Dame often take themselves way too seriously. Their traditions. Their history. What they will or won't do. Both consider their uniforms sacrosanct. Yet this season in their game against each other, they will debut special uniforms. They are calling them throwbacks, but Michigan's version is much more of a throwback/future clash. I used to hate this sort of overt marketing but now I am a convert. And I am also wondering if these two self important programs can mix it up a little, then why not BC? BC last used throwbacks in 2004. The style recalled BC's uniforms of the mid-'80s. It was a nice touch but not exactly what I had in mind. I want BC to do something unique. Let's get Under Armour involved! I loved what they did with the basketball uniforms. Think of what they might do with a one time only event. A logo on the helmet? Wings? I know BC fans tend to be traditional. I am not naive enough to think that one uniform will change our momentum on the field. It won't put butts in the seats. But it's something. There is tremendous apathy surrounding the program. It will take a numerous small steps to change that apathy. Changing our look for one game seems like a low risk way to shake things up. Gene likes to say that BC tries to be Harvard during the week and Alabama on Saturdays. If we break out some gimmicky uniform, then we can say we are Harvard during the week and Oregon on Saturdays. New season. New format. Instead of a digestible combo of factoids and opinions, I am going to write in a more narrative, free style post. As always, feedback is appreciated. Do you think Montel Harris knows who Rodney Dangerfield is? Because I sort of feel like his entire BC career has been about "No respect." Harris is poised to own every school rushing record but no one seems that interested. "Too small" -- he carries tacklers like no other little man in the ACC. Third offense in four years -- no big deal. Return kicks -- he's done it. Return punts -- check. Harris is even a good pass catcher. I don't think we appreciate how great Montel Harris is. Think about the Florida State game from last year. Despite some huge gains, many BC fans bemoaned Harris's lack of speed. The general opinion seems to be that he's very good but not great. I disagree with that sentiment. Harris is great. Yet my fear for this year is not the new offense. What has me slightly concerned is his knee. I fear that a nagging injury he might not have the crescendo to his career that he deserves. As I run on and on about Harris being under appreciated, I am indirectly overlooking the rest of our backfield. Andre Williams has the power. He has the speed. He runs people over and gets fans excited. Despite the glimpses he's still unknown and that unknown quality will generate plenty of talk among the fans this year. Let's establish the Williams questions now: Will he get the carries to make an impact? Will he adjust to the new offense? Can he be patient waiting for holes to open and reading his blocks? Can he become a pass catcher? Will he get a few snaps as fullback? Remember Deuce Finch? Sidelined by mono and then a redshirt, we haven't seen him on the field in a season and a half. Long layoffs do weird things. Some guys come back renewed and motivated. Others never regain their form. Who knows what we can expect from Finch. Tahj Kimble is another youtube and message board favorite. He's from the same area as Montel with a similar style. You know what that means? Nothing. It's a crowded backfield. However, Kimble or Finch or even Williams will have their chances to make a mark. Special teams or as a change of pace. And in a way that is perfect. We've lacked a sense of urgency on offense for a long time. We need hungry guys. Guys looking to make a difference. One of these guys will make a big play. We have some other guys, but I doubt any will get real playing time. Another unknown is if and how Rogers will use a traditional fullback. As you put together these previews the questions surrounding BC pile up. But running back is one area without worry. We are experienced. We are deep and we have a variety of styles. Plus we have one of the most underrated players in the country. Although I wasn't blogging at the time, I was big fan of Lenny Walls when he was playing for BC. But I never would have predicted that he'd still be playing ten years later. Lenny deserves credit for hanging on and also for finishing his degree. HD doesn' seem concerned about Montel Harris's knee. I guess the late scratch at the Bowl game has me cautious. Kenny Florian won his first fight at the new weight class. “While I am a Tennessee graduate (Master's Degree) and love UT and Knoxville, my heart is here at Boston College. I am very fortunate to have the only job I want. Anne and I will remain at BC for many years to come." Frustrated that the Globe and Herald hadn't reached out to Gene for comment, I asked BC this morning for him to go on record. The above is what I got back. There you go. FWIW Gene D to Tenn has legs. Also interesting the Gene hasn't pulled his name out of consideration. Gene is one of many names being considered for the position. He's popular with those aligned with Phil Fulmer. He is not considered the front runner but is a real candidate. What is surprising is that many around BC think Gene would take the job if offered. Despite what has been implied in the past, Gene was never offered the job during Tennessee's last AD search and therefore never turned the job down. If he is actually the selection this time and offered, a few people think he would take it. The pay day, prestige and the "challenge" would be the motivation to leave Boston. Tennessee named an interim AD Thursday. That buys them some time, but I doubt they want to drag this process into the football season. Football is their time to get fundraising going. They need the new AD in place soon. And as I tweeted, as long as Gene doesn't remove his name publicly, there is a chance BC will be looking for a new AD too. Despite the rebuilding season, three BC baseball players were drafted Wednesday. Senior RHP John Leonard obviously can sign with the Giants right away. Juniors Mike Dennhardt and Brad Zapenas will have to decide if they will leave now or play one more year at the Heights. The three join Garret Smith who was drafted by Tampa Bay on Tuesday. Here is more on BC's latest commitment. The opportunity to play Center was a key selling point. Although we missed out on his teammate BC is still in the mix for Kaleb Tarczewski. He's scheduled three visits with the big programs. Let's hope Donahue gets him on campus. Sylvia Crawley added a new assistant to her staff. Gene's name is still coming up for the Tennessee job. Will he make a public statement regarding the opportunity? When the NFL resumes, Matt Tennant will be fighting for a starting position in New Orleans. Looking for a career boost, Kenny Florian is dropping down in UFC weight classes. As expected the BC-UCF game will be in prime time on CBS College Sports. This isn't much of a surprise. CBSCS has the rights to Conference USA games and usually jumps at the chance to show a game when a Conference USA team hosts a BCS team. As for carriage, most of you can get CBS College Sports in cable and satellite sports packages. Philly OL prospect Frank Taylor is expected to commit to BC on Wednesday. Taylor has a good mix of offers from big time programs and academic schools. He seems like a good fit, now let's get some more. Here is another season preview. It's pretty straight forward. One pattern I have noticed is that no one seems concerned about Harris's recovery. BC is not the only ACC school struggling to sell tickets. After forcing out the scandal plagued Mike Hamilton, Tennessee is looking for a new Athletic Director. Gene DeFilippo began his career at Tennessee and has kept close ties to the school and its network throughout his career. In fact, Gene has said that Tennessee did reach out to him years ago, but he wanted to stay at Boston College. Now as the Vol Nation looks for a new AD again, will they come back to Gene? There are a few factors that will probably stop this conversation before it starts, namely Gene's age. I imagine Tennessee will want a long term solution and Gene is more of a five year option as opposed to a ten year. Secondly many of Gene's relationships were tied to Fulmer people. I don't know how much that means now or will impact his candidacy. Gene was a much more viable candidate when he was Fulmer's "guy" and Phil was winning National Championships. I also don't know if Gene would want to take the Tennessee job. He has unusual power for an AD at a BCS school. He's spent some time this offseason refuting his rumored level of involvement in football. At Tennessee any overstep or piece of gossip would be much more scrutinized. But like I mentioned with TOB, all of these guys have egos and for Gene, landing a big SEC job with one last big pay day might be tempting. BC has been involved with Canaan Severin early on and now other schools are lining up. He's one of the top prospects on our list and one of the top prospects in New England. Canaan says he wants to make a decision this summer and puts UConn and BC above others. Let's hope the staff can close him out and build on the recent recruiting momentum. Although many BC names are being rumored for the BU job, it looks like Richard Pitino (Rick's son) is the front runner for the opening. I think a solid BU program is good for BC and Boston. I also think they will make a big mistake with Pitino who will bolt at the first chance rather than a Boston guy who will want to stay and build something at BU. Phil Steele has a bunch of metrics that he relies on. One is returning yards and another is returning tackles. BC is top 5 in one and top 50 in the other. I am not expecting miracles this year, but we cannot let expectations be lowered either. There are many positive indicators. Luke Kuechly is ranked 29th in CBS's ranking of college players. Derrick Rossy is looking to make a career out of boxing. For many of us our history as BC fans begins the day we set foot on campus. But there is a long history of diehards that have been bleeding maroon and gold for decades. 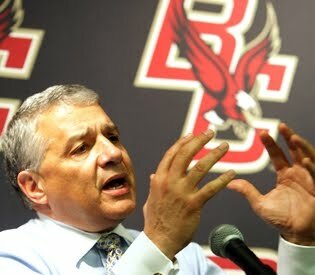 BC honored one of those diehards last week when they gave Don Croatti the Donlan award. Croatti is one of the founders of the Gridiron Club and a past president of the Varsity Club. Due to the depth at Shooting Guard, Hoopsworld thinks that Reggie Jackson will fall to the second round. Yet when I see some of the names supposedly ahead of him ( Iman Shumpert? Really?) I think either the analysts are way off or NBA GMs didn't really watch Reggie play. Here is a good review of the disappointing baseball season and what's ahead. Around the Res took a deeper look at new verbal commitment Sam Grant. Although it was a friendly the USA had a lot to play for against Spain today. Fittingly for Bob Bradley's teams they laid an egg and got blown out. The only silver lining from the BC side was that Alejandro Bedoya came on in the second half as a substitute. He obviously didn't change the course of the game, but hopefully this is a sign that the former Eagle will get more time in upcoming USA matches. Here is a decent preview of our team from a Northwestern site. Here is more on our new Tight End Sam Grant. The other day I suggested focusing on Ohio in the wake of the Jim Tressel mess. Well it didn't take long for my new strategy to start paying dividends ;). 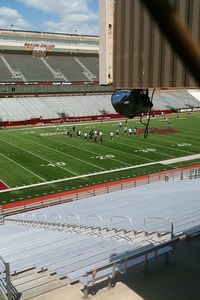 BC added to their 2012 class with a verbal commitment from Ohio Tight End Sam Grant. Grant had offers from some Big Ten schools too. I received confirmation today that the Patriot players used Alumni for free. This sort of surprised me. I assume BC would have wanted a few bucks and would also want to set precedent. But then again if Tom Brady and crew keep doing things like visiting the Town School then it will all be worth it. BTW, Dan Koppen was the Patriot who originally reached out to BC to coordinate the practices. Former Eagle Ron Brace's family were near the eye of the storm in Springfield. One of the dominoes of Big Ten Hockey could be Notre Dame joining Hockey East. It's not BC but you have to like the idea of more football at Alumni. I am trying to find out more regarding the logistics of the Patriots using Alumni, but on the surface I think it helps BC. BC can sell this to recruits -- "we have a great relationship with the NFL..." and I also think this raises awareness among those Patriot fans that ignore BC. Anthony Castonzo is working out with his unofficial teammates. Here is the latest on beer sales at college campuses. BC is not mentioned, but I think this would be a great idea for BC for financial and attendance reasons. The basketball roster filled out a bit with three new players. I don't expect any of them to be big factors, but it is nice to round out the roster. Plus the new crew had pretty good success with walkons and post grads last season. Donahue also has offers out to members of the 2013 class. Admittedly I have a hard time keeping up with the different contests, but the sailing team picked up another title. The other day in my Stanley Cup post, I failed to recognize Cory Schneider as a key backup for Vancouver. (Thanks to Peter F and the others who called me out.) Although he's from Massachusetts, his family is clearly rooting for the Canucks. Mark Herzlich raised a few eyebrows with this quote: "I'll be the Cam Newton of free agency..." Personally I think the USA Today took his quote out of context. It makes him seem like an overly cocky guy...especially considering he wasn't drafted. However, if you read the full quote in context, you would quickly realize that Mark still has perspective. Assessing his current value, Herzlich chuckled, "I'll be the Cam Newton of free agency, who knows?" I bolded the key phrases. This has been floating around for a few days but I thought it was worth highlighting. I hope someone from BC can get through to Spaz that he needs to change his approach to the media. The poor us, empty cupboard stuff is charming when you've won championships. When you are coming off mediocre seasons the poor us meme just kills marketing. Of BC's current seniors, Donnie Fletcher might strongest NFL prospect. It looks like former Eagle Alejandro Bedoya will be playing for the US squad this summer. BC is still in play for Georgia Tight End Joshua Parris. Reggie Jackson did have surgery in May, which explains why he did not take part in some predraft workouts. Although I wanted BC to take advantage of the NFL Lockout, I didn't have Patriots' practices in mind. Luke Kuechly should be on multiple preseason All America lists.